In this context, environmental risks to health are defined as all the external physical, chemical, biological, and work related factors that affect a person’s health, excluding factors in natural environments that cannot reasonably be modified. Environmental risks to health include pollution, radiation, noise, land use patterns, work environment, and climate change. These risks are driven by policies in sectors outside the health sector, such as energy, industry, agriculture, transport, and land planning. More cooperation is needed if the health sector is to effectively tackle NCDs and reduce health costs resulting from policies in other sectors. Here, we summarise the evidence for the links between environmental risks and NCDs, review existing solutions and interventions, and outline opportunities for reducing environmental risks as part of an intersectoral NCD agenda. In 2016 air pollution was the second largest risk factor causing NCDs globally, just after tobacco smoking (fig 1). In many countries—for example, in southeast Asia—air pollution is by far the largest cause of NCDs. NCDs are further exacerbated by climate change, which has already started to amplify cardiovascular and respiratory mortality during more frequent heat episodes. Without more action, people will increasingly be affected by environmental risks to health. Many practical solutions and tools are readily available to curb pollution and create healthier environments. Efficient strategies often require action in sectors beyond the health sector, in areas such as reduction of air pollution, the safe use of chemicals, protection from radiation, occupational safety and health measures, and workplace wellness (see web appendix on bmj.com). Creating healthier environments for reducing NCDs also results in many health and non-health co-benefits. Many policies combatting air pollution also mitigate climate change.18 Replacement of polluting cooking stoves with cleaner energy solutions and better energy efficiency of homes and buildings leads to cleaner air and limits climate change. For transport, less polluting vehicles, combined rapid transit with walking and cycling, and replacement of short urban motorised journeys by walking and cycling would increase physical activity and improve access to jobs. In agriculture, banning open burning both reduces air pollution and mitigates climate change; lower red meat consumption reduces NCDs directly and mitigates climate change through reduced gas emissions from livestock.18 Reducing air pollution from coal fired power plants may not only diminish health risks due to combustion particles but also prevent mercury from entering the food chain. Such co-benefits need to be accounted for in economic evaluations of environmental health action. Acting on environmental risks can reduce health inequity, as women and the poor are disproportionally affected. Women and children are more exposed to harmful smoke caused by cooking, heating, and lighting with unclean fuels and inefficient technologies. Environmental risks to health can to some extent be influenced through personal choices (vegan diet, transport choice) but are likely to be more affected by policy measures (incentivising clean technologies, carbon and fuel taxation) necessary to deliver on the Paris Agreement on climate change. Implementing wide ranging policy changes may be more equitable than acting on individual behaviour. Despite certain successes, the overall burden of disease caused by the environment has not decreased. In addition to the practical solutions, more organisational and structural measures are needed. Given that decisions leading to healthier environments often lie outside the health sector, the health argument needs to be integrated at the level of these “upstream” decisions (choices made at the level of policy setting).19 Failing to do so, by selecting options that may be economically sound for the particular sector but may not be healthy, will merely result in transferring costs to the health sector and society at large (fig 2). With the Agenda 2030 for Sustainable Development, the world is calling for a new approach to health, environment, and equity, generating high level political support for tackling health determinants in a preventive and sustainable way. Together with the increasing NCD epidemic and its high costs to society, a unique opportunity exists for changing the way the global health community, policy makers, and society at large engage and shift focus towards prevention of disease through healthier environments. The past few decades have seen a global epidemiological transition from communicable diseases to NCDs, with major causes being pollution and other environmental risks. NCDs cannot be sustainably controlled without the global health community being actively engaged in the shaping of environmental drivers of health, taking up new leadership and coordination activities across all relevant sectors. Interventions to reduce environmental risks to health may have multiple co-benefits, such as increasing social equity, mitigation of climate change, and increasing energy efficiency. Contributors and sources: Information sources include a review of the effects on NCDs of environmental risk factors and the draft WHO strategy on health, environment, and climate change. APU conceived the outline of the paper and drafted the first version. MN is the director of the department and provided overall guidance. All authors contributed intellectual content, provided specific inputs on their area of expertise, edited the manuscript, and approved the final version for submission. Competing interests: We have read and understood BMJ policy on declaration of interests and have no relevant interests to declare. The authors alone are responsible for the views expressed in this article, and they do not necessarily represent the views, decisions, or policies of the institutions with which they are affiliated. This article is part of a series proposed by the WHO Global Coordination Mechanism on NCDs and commissioned by The BMJ, which peer reviewed, edited, and made the decision to publish. Open access fees are funded by WHO. This is an Open Access article distributed under the terms of the Creative Commons Attribution IGO License (https://creativecommons.org/licenses/by/3.0/igo/), which permits use, distribution, and reproduction in any medium, provided the original work is properly cited.
. Preventing noncommunicable diseases (NCDs) by reducing environmental risk factors. WHO, 2017.
. Noncommunicable diseases country profiles 2018.WHO, 2018. World Health Organization. Global Health Observatory - Data repository. 2018. http://www.who.int/gho/database/en/. Institute for Health Metrics and Evaluation. Global Health Data Exchange Seattle: IHME. 2019 https://gbd2016.healthdata.org/gbd-search/.
. Ambient (outdoor) air quality and health. Fact sheet.WHO, 2018.
. Preventing disease through healthy environments: a global assessment of the burden of disease from environmental risks.WHO, 2016.
. Preventing disease through a healthier and safer workplace.WHO, 2018.
. Urban green spaces and health - a review of the evidence.WHO Regional Office for Europe, 2016.
. Policy brief #2: Achieving universal access to clean and modern cooking fules, technologies and services; Policy brief #10: Health and environment linkages - maximizing health benefits from the sustainable energy transition. Accelerating SDG7 achievement Policy briefs in support of the first SDG7 review at the UN high-level political forum 2018.United Nations, 2018. Campbell-Lendrum D, Prüss-Ustün A. 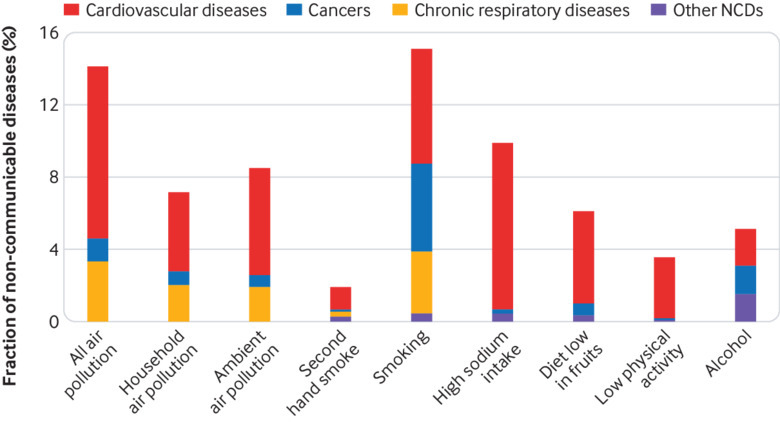 Climate change, air pollution and noncommunicable diseases. 2018. https://www.who.int/bulletin/online_first/18-224295.pdf?ua=1.
. Public spending on health and long-term care: a new set of projections.OECD, 2013.
. Health, environment and climate change. Report by the Director-General. EB142/12.WHO, 2017.
. Health in all policies: training manual.WHO, 2015. Australian Public Service Commission. The whole of government challenge. 2018. https://www.apsc.gov.au/1-whole-government-challenge. World Health Organization. Draft WHO global strategy on health, environment and climate change. 2018. https://www.who.int/phe/publications/global-strategy/en/.